Most people assume that B2C ecommerce is the “big brother” and B2B is trailing way behind, but it is time to think again. Research from Forrester shows that, in the US, B2B ecommerce is now twice the size of B2C ecommerce and predicts that B2B ecommerce sales in the US will reach $780 billion by the end of 2015. That represents 9.3% of all B2B sales! Equivalent European B2B figures are not available (let me know if you can find some!) but European ecommerce market as a whole is dominated by the big three (UK, Germany and France) which together are responsible for 81.3% of European ecommerce sales. This is predicted to reach $236 billion in 2015 with an average rate of growth of 25.2% for the big three. The trend is a global one according to research provider Frost & Sullivan. Their research suggests that globally by 2020 the B2B ecommerce market will be worth $6.7 trillion and the B2C market half the size at $3.2 trillion. The need by B2B companies to reduce their costs. Some companies report decreases in the cost of sales by up to 90%, by guiding customers to an online self-service ecommerce environment. Buyers also benefit from the self-service automated approach to purchasing. According to Forrester, 7.3% is the average conversion rate on B2B ecommerce sites, compared to 3.0% for B2C retail sites. B2B online buying will also see an increase in the use of mobile ecommerce as the trend for employees of the purchasing companies will use smartphones and tablets to buy goods anywhere and anytime. A further step in this direction was made by Google in April 2015 when the mobile friendly aspects of a website are now taken into account when presenting search results. 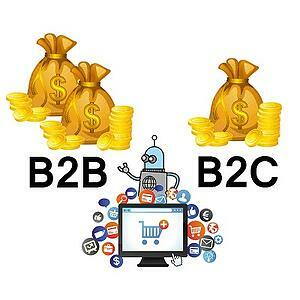 Many B2B buyers now prefer to both research products and buy online. Strong growth will continue over the next five years, especially purchases via mobile devices. It is worth noting that Grainger, a pioneer in B2B ecommerce, has stated that 94% of its 2014 revenue growth came from online sales. On a final note I see today, 24 April 2015, that technology giant Amazon has published results showing its web services business generated sales of $1.57 billion in the first quarter of 2015 and is profitable. Amazon Web Services (AWS) is a cloud computing offering that makes money by charging businesses to host websites and other applications including ecommerce platforms. If you are a looking to make the most of B2B ecommerce for your business I suggest you read the ibt partners ebook.